Water is important to keep our bodies functioning correctly. I n fact, 60% of our bodyweight is made of water. 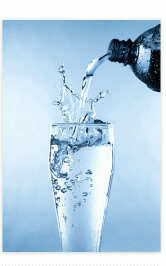 Water helps cleanse the body of toxins and brings nutrients to cells. It is especially important to pay attention to water intake in hot climates or when exercising. Women need about 9 cups while men need about 13 cups of total beverages a day. However, living in a hotter climate or working out easily increases this amount. Dehydration occurs when your body does not have the amount of water it needs in order to perform normal functions. This will drain the body of energy even if it is only mild dehydration. So remember to drink more water this summer so you can stay energized and hydrated! Is the heat getting to you? Cool off with one of these delicious and refreshing treats! Blueberry Ice: In a blender or food processor, combine the blueberries and grape juice and pulse until mixed, about 30 seconds. Working in batches, strain the mixture into a medium-size bowl through a medium mesh strainer. Add the maple syrup, lemon juice, and salt to the bowl and stir to combine. Transfer the mixture to a 9- by 13-inch pan, cover it with plastic wrap, and freeze it for 1 hour. Remove the pan and scrape the mixture’s frozen edges into the center with a fork. Freeze it another hour, then scrape the ice crystals into the center again. Return the pan to the freezer for at least 1 more hour, or overnight. If the mixture is too firm to scoop when you’re ready to serve, scrape it to loosen the crystals. Makes 4 cups. Lemon Ice: Bring the water, sugar, and salt to a simmer over high heat and stir until the sugar is dissolved. Remove the pan from the heat and stir in the lemon juice. Pour the liquid into a 9- by 13-inch pan and let it cool to room temperature, about 15 minutes. Cover the mixture with plastic wrap, then freeze and scrape as you did for the Blueberry Ice. Makes 3 cups. In a small saucepan, combine 1 cup of the water and all of the sugar. Bring the liquid to a simmer and continue simmering it for about 3 minutes, stirring often, until the sugar dissolves. Remove the pan from the heat and let the syrup cool. Put the berries and the remaining 1/4 cup of water into the bowl of a food processor and puree them for 30 seconds. Strain the puree to remove the seeds. In a pitcher, stir together the cooked syrup, the orange and lemon juices, and the seedless berry puree. Pour the mixture into two ice-cube trays and freeze until firm (generally 6 or more hours). A pitcher or a mixing bowl with a spout will make filling the ice-cube trays easier and neater. When you’re ready to serve the sorbet, chill serving dishes in the freezer and briefly chill your food processor bowl and blade as well. Then transfer the fruit cubes to the food processor and pulse them, in short bursts, to make a smooth sorbet. Spoon the sorbet into the chilled dishes and serve immediately. Makes about 6 servings. Place liners in a mini-cupcake pan. Put a wafer cookie, flat side up, in the bottom of each well. In a medium-size bowl, whisk together the yogurt, cream cheese, lemon juice, and honey until smooth. Spoon 1 heaping tablespoon on top of each cookie, then top the mixture with the fruit. Cover the pan with plastic wrap, then place it in the freezer until the fruit bites are firm, about 1 to 1-1/2 hours. Remove the tray from the freezer for 15 to 25 minutes before serving. Serves 12. 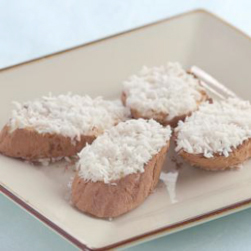 For other recipes and nutritional information, go to: http://familyfun.go.com/summer/summer-recipes/summer-snacks-treats/. 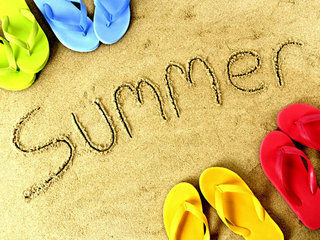 Are you running out of things to do this summer? Here are a few suggestions to help you make the most of your extra time. Enjoy a picnic by the pool. Keep cool under the shade of an umbrella while still enjoying a nice summer day. Make something light and fun like sandwich wraps. Have a Hawaiian Luau. Decorate with Leis and bring the tropical spirit to your home. Make something with pineapple or other tropical fruit and you’ll be set! Go for a bike ride. Find a scenic route and enjoy the outdoors. Make sure to pack a healthy snack such as trail mix and have plenty of water. Check out a farmers market in your area. There should be fun things to look at and fresh produce. Take something home and enjoy it with your next meal. Do some community service. Join or create a group and help someone in your neighborhood or community. Nothing beats the feeling that you are making a difference for someone in need. Remember to spend your extra time with those you care about and try to stay cool! Bob Harper from the hit NBC show The Biggest Loser has recently written a cookbook called The Skinny Rules: The Simple, Nonnegotiable Principles for Getting to Thin. In this book, he talks about the importance of reading food labels and eating the correct portion sizes. Harper says it’s also important to make at least 10 meals at home every week. Learn to read food labels; stop guessing about portion sizes; have a meatless day each week; make at least 10 meals a week at home; cut off eating three hours before bed; sleep right; and, thankfully, allow yourself a splurge meal once a week. Luckily, freschef meals already contain correct portion sizes for your body and are nutritionally balanced. Spend less time counting calories and more time enjoying your meals, while achieving your heath goals. Are you looking for a healthier way to quench your sweet tooth? Add fruit to your desserts and enjoy benefits such as high vitamin content and antioxidants. Here are some tasty recipes with fruit you can try. Preheat grill to high. Brush peach halveswith oil. Grill until tender. 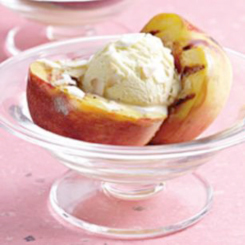 Place 2 peach halves in each bowl and top with a scoop of frozen yogurt (or sorbet) and coconut. Get Power from your Veggies! Vegetables are so important for a diet because of their many health benefits. They may reduce the risk for heart disease, heart attack, certain types of cancers, obesity, type 2 diabetes, kidney stones, and decrease bone loss. So many nutrients are packed into just a small amount of vegetables. They do not contain cholesterol and are always low in fat and calories. Some of the power nutrients they contain are potassium, dietary fiber, folate (folic acid), vitamin A and vitamin C.
Keep yourself strong and healthy by making half your plate fruits and vegetables as instructed by the USDA. Exact amounts for different ages and gender can be found at http://www.choosemyplate.gov/food-groups/vegetables-amount.html#. Freshef meals make it easy to cut down on cooking time. Why not use those extra minutes to have a meal as a family? 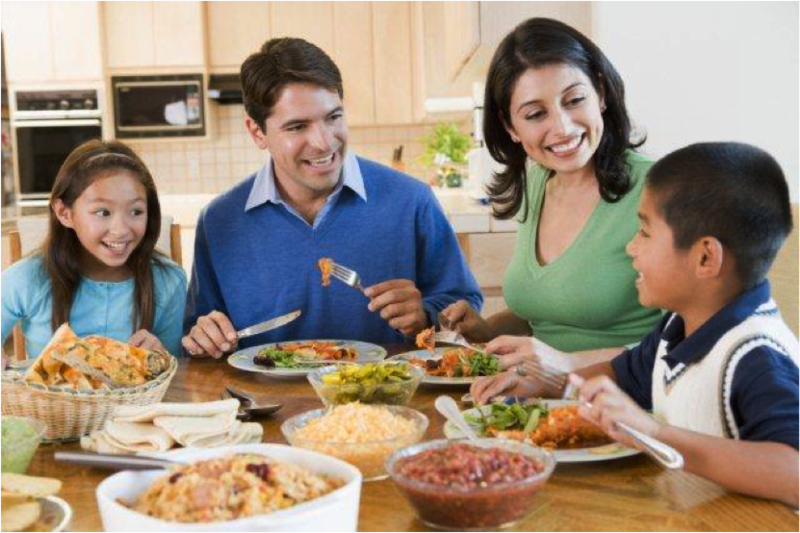 Studies have shown that eating meals with family have several significant advantages; so put away the TV trays and pull up a chair to the dining room table! Kids who eat dinner with their families are shown to have a healthier weight and better eating habits than those who don’t. They are also considerably less likely to have eating disorders. Aside from the health benefits, children are more likely to have a better vocabulary and conversation skills when they spend meals with their family. They are more likely to succeed in school, and have better relationships with their peers. Overall, they are happier and have better bonds with their families. If you are not currently eating regular meals together, start small. Set a goal of eating together twice a week, and build from there. Meals don’t need to be elaborate or time consuming. Planning ahead will reduce the stress of last minute trips to the grocery store. And don’t forget- keep the family involved with the preparation- kids can help cut vegetables, set the table, or even plan the menu. Most importantly, make family mealtime enjoyable!